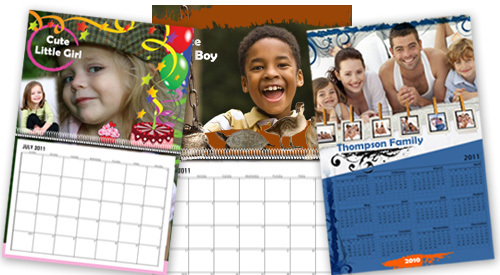 Photo calendar printing has never been easier than now with Photogalley's easy to use photo calendar design software. Simply upload your photos, pick a theme and auto-flow the photos throughout the calendar. Enter all the special dates for the year. 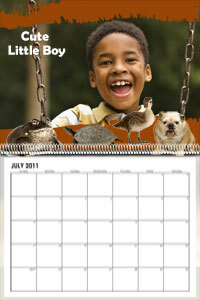 Custom calendars make great gifts, fundraisers and promotional tools. 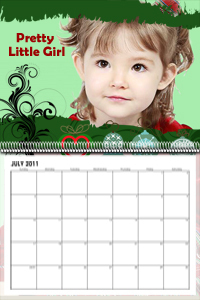 Creating a photo calendar online is not difficult any more with our photogalley online calendar design software. Select a free 12"x9" wall calendar (open size 12"x18")design theme, decide a start month, add your photos, and customize your special dates! You will then have a beautiful photo calendar printed on thick card stock, bound with sturdy spirals and shipped in your hands in just a couple of days! Or, you can just select just one photo or a couple of photos to design a yearly calendar in just 2 or 3 minutes! Quick and easy, they are just the two best words to describe our photo calendar program! 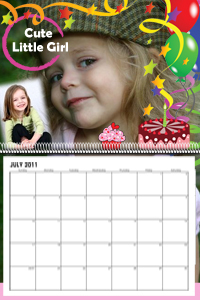 Nothing can be better to make your digital photos shining everyday with a personalized photo calendar to your loved ones! 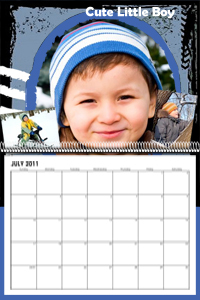 You can either select to print a 12 or 18 month 12"x9" monthly photo calendar, or just one sheet 12"x18" yearly photo calendar, with unlimited design flexibility, your photo calendar gift will become a precious gift through the entire year, even become a keepsake memory for many years to come.